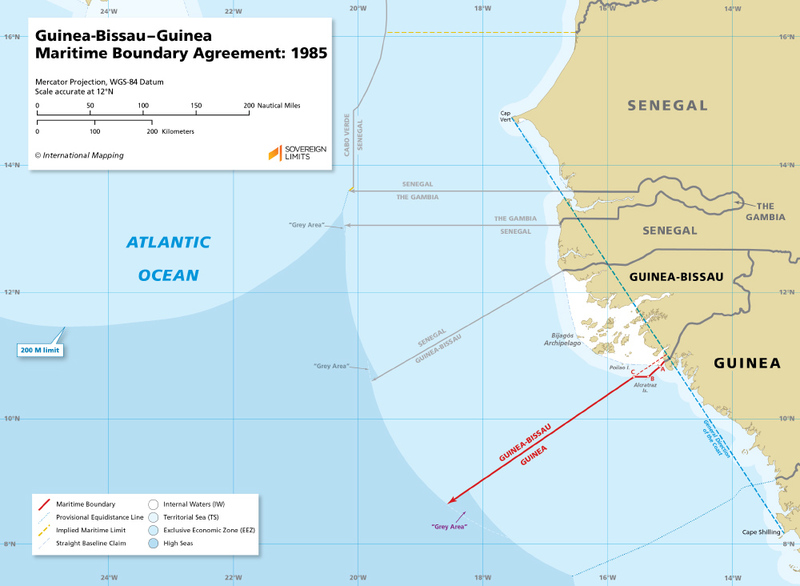 On 14 February 1985, Guinea and Guinea-Bissau had their maritime boundary dispute resolved by arbitration. The question arose over whether or not the 1886 Franco-Portuguese colonial Convention, which delimited their land border, also defined a maritime boundary between modern-day Guinea and Guinea-Bissau. The Tribunal determined that the historic agreement did not delimit their maritime frontiers, and it therefore fell to the arbitrators to define the boundary. The maritime border continues from the land boundary terminus in the thalweg of the Cajet River through three specified points before following the azimuth of 236° to the outer limit of Guinea’s and Guinea-Bissau’s 200 nautical mile exclusive economic zone jurisdiction.